The title of this post is a reference to this old post of mine, which I wrote after reading the first volume of Michael Palin's diaries. (Palin is a wonderfully detailed, and really rather strangely fascinating--not to mention often funny--self-chronicler, but after digesting his second volume, I never went on to the third.) Of course, every Monty Python fan knows that when John Cleese and Palin performed together, not just laughs but absolute comic brilliance was within reach: I mean, you've got The Cheese Shop, The Argument Clinic, The Fish-Slapping Dance, and, of course, The Parrot Sketch. We know what Palin brought to that equation: a kind of preternaturally, unintentionally unnerving normality, or at least naivete. Cleese, however, brought the anger--or perhaps a strangeness, which he was also almost always vaguely (or viciously!) angry about. And now that I've read his wonderful memoir So, Anyway..., I can testify: John Cleese, at least insofar as he chooses to present himself here, is a very strange and unsettling man. He's also terrifically funny, of course--a smart comic writer, a gifted physical comedian (another great Cleese-Palin combination there), and a man capable of some of the greatest slow burns and insane outbursts in the whole history of any media....but undeniably strange. Reading Cleese's presentation of his early life (the memoir runs from his family history and birth up to the founding of Monty Python in 1969, then almost entirely skips the next 45 years to conclude with Cleese's take on the Pythons' wonderfully nostalgic--and sometimes actually, genuinely funny--live farewell show) convinces me that much of his skill at making us laugh is in fact because of his strangeness. Remember that the same root which gives us "strange" also gives us "estrangement," and Cleese shows himself in this book as constantly on the edge of feeling at least partially estranged from, and thus confused and even sometimes terrified by, almost everything. That includes his parents, his school teachers, his fellow students, women in general, the various techniques and technologies of both performing live and performing on film or television, the vicissitudes and opportunities of university life, and really just about everyone who seemed more capable of negotiating and/or escaping from the perceptions and expectations of the English class system--Cleese is very emphatic about his origins in the "middle-middle-lower-middle class" (pg. 30)--than he. And finally--and this is really the most important part of Cleese's psyche, I think--he is deeply bothered by his own frequent sense of estrangement, alienation, and disconnection. There is, in short, a deeply self-focused anger about the man, a separation from himself that sometimes comes off as a clinical fascination with his own overwrought thought processes (there are multiple moments in the book when he, as he reconstructs various triumphs and failures, essentially recollects that the worst thing he too often does is "think about thinking"--pg. 250), but sometimes also borders on self-contempt. It's a fascinating psychological journey to be taken on, though of course because Cleese is a talented man who has had some marvelously fun opportunities in his life and has met and been influenced by (and sometimes made enemies of) some truly remarkable people, following that psychological journey is made all the more entertaining. Does this make Cleese my favorite Python? I don't know. It's absolutely clear that without him, Monty Python would have never existed, at least not in the form it did: he was the only one who had, at one point or another (either while at Cambridge, or while on tour with the Footlights in America, or while writing and performing for various BBC television shows in the early to mid-1960s), met and worked with and had access to every single person that made the Flying Circus possible: not just all the other five members of the troupe, but the directors and consultants and managers who were familiar with and liked Cleese's work, and thus opened the BBC's doors to them. And it's widely recognized that the Flying Circus's fourth season, which Cleese didn't participate it, is the weakest of the four...though that's also the season where the more clearly cinematic imaginations of Terry Jones and Terry Gilliam are most visible. (Cleese is fervently proud of--and deservedly so!--A Fish Called Wanda, probably because he recognizes that he is first and last a sketch artist, a writer of "good jokes and funny scenes," who has "managed to write only one really good film script in fifty years"--pgs. 354-355.) Mostly I would have to say that, if Palin was the most adaptable, open-minded, and likeable Python, then Cleese was the most essential Python, the man who was, however unexpectedly--the notion that success simply fell into his lap without him knowing what he was doing is a constant theme throughout the book--the constant and reliable font of the raw comic materials which allowed all the others to become catalysts for. 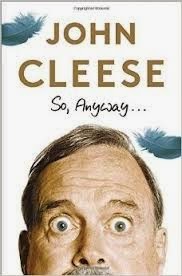 It needs to be said that Cleese's memoir is a great one to argue with and wonder about--a result that he almost certainly would be pleased with. He has opinions on everyone from P.G. Wodehouse ("a very good comic writer rather than a great one"--pg. 26) to Peter Sellers ("the greatest impersonators often have strangely colourless personalities"--pg. 339), on everything from Americans' often money-grabbing lack of any sense of vocation (pgs. 210-211) to how photographic technology has made the relationship between fans and celebrities even worse (pgs. 321-322). The stories of his awakening to the fact that he was surrounded by gays and lesbians in the arts world around him, and his reaction to his writing partner Graham Chapman's coming out are hilarious--and revealing of how very much Cleese was shaped by the preferences and prejudices of his ordered, rural, moderately-if-not-truly poor, conservative upbringing in Weston-super-Mare, despite no longer holding to many of those expectations (pgs. 210-211, 305-307). He's a man of easy resentments, if only because his longings for the world so often revolve around rules which he remains attached to, even as he beats up himself over that fact. The political ignorance he sometimes shows--the man thinks, at least in this book, overwhelming about how things affect him, and almost never how they might affect other people--is embarrassing, but forgivable. He has given his readers here, I think, a great document of someone living through the disappearance--or has it, really?--of the old English class-bound world. The fact that it came from someone's whose own writing and acting played a not insignificant role is teaching us all the naughty delight of kicking that world while it was on its last legs is just icing on the cake. Saturday Night Live Music: "More Than a Feeling"
Saturday Night Live Music: "In a Big Country"
Saturday Night Live Music: "Forever Blue"
Saturday Night Live Music: "The New Year"